According to a recent article in The New York Times, the Boeing 787 Dreamliner has once again taken to the skies after a succession of incidents involving battery fires on the innovative jetliners. After being grounded since January, Boeing and the FAA have been developing and testing a newly designed battery to replace the original one used prior to the plane’s grounding. A new titanium system to vent any smoke or heat from the aircraft has been put in place, as well as steel boxes to encase the batteries and decrease the amount of oxygen available for fire prevention. These scheduled test flights have a very good change of obtaining federal approval for the Dreamliner to resume normal flights. Could this aircraft finally be ready to be put to use commercially? The airlines that own these 50 aircraft surely hope so. What will this mean for the metals and manufacturing industries? Could this be the increase in production the steel and aircraft industries have been waiting for? The Dreamliner, which is composed of 50% composite materials, was intended to be the next evolution in aircraft manufacturing and commercial flight, boasting a 20% weight savings and reduced fuel consumption over its heavier predecessors. 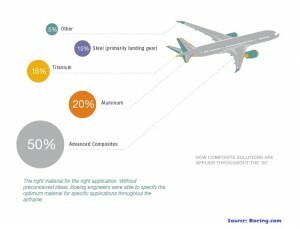 As with all aircraft, there is still a need for the metals industry. The Dreamliner contains about 20% aluminum, 15% titanium and 10% steel in its construction. How will your business be affected by the increase in production of this aircraft? How will this impact metal production and availability? As most us in the metals industry already know, there are already shortages of certain grades of steel, titanium, stainless steel and aluminum associated with the Dreamliner’s production. If this troubled, but groundbreaking, aircraft is finally cleared for takeoff, its effect on supplying these necessary metals grades could become critical, not only for those in the aerospace industry but for those who also need steel, titanium, stainless and aluminum for other applications. Tech Steel & Materials can help you procure the materials you are in need of for your production runs. Contact us today.